Mangaluru, Mar 16, 2017 : Eminent rationalist Prof. Narendra Nayak who has been the driving force behind the fight for justice in the RTI activist Vinayak Baliga murder case, through his sheer presence of mind escaped an attempt of assault by some miscreants on the morning of March 15, Wednesday. 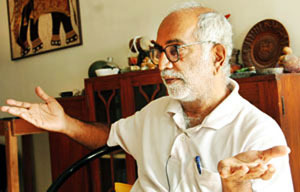 Incidentally, Prof. Narendra Nayak had prior information of a possible attack on him. The incident occurred at around 6.25 am when Prof. Nayak as usual was heading towards Ladyhill from Lalbagh towards the Mangala Swimming Pool. Around this time two strangers who arrived by bike stopped in front of his car and told Prof. Nayak that his car tyres had got punctured. Prof. Nayak who had checked the tyres before starting and found everything in order was aware of the intention of the strangers and proceeded without stopping his vehicle thus defeating the ploy of the miscreants to assault him once he alighted from his car. Prof. Nayak has strongly suspected the involvement of Baliga murder accused behind this act and adds that the miscreants who approached him might be the hired goons who were acting at the behest of some one. Prof. Nayak who is facing threat to life ever since he has been spearheading the fight for justice in the RTI activist Vinayak Baliga murder case has been provided gun man protection. However, the miscreants had followed him on March 15 morning being aware that the gunman was not along with Prof. Nayak during that time. Prof. Narendra Nayak has lodged a complaint with Barke police and the case has been entrusted to the CCB police. Meanwhile, following the incident Prof. Nayak has been provided 24 hour prtection by police gun men. Why hasn’t Naresh faced the narco analysis yet? He is accused but still he has got Bail. The police should have an eye on his activities and take the records of the past calls. Nayak Sir should not take risk unnecesarily. The biggest mistake is granting bail to Naresh Shenoy whom is the main accuse in Baliga case. Mr Nayak has always stood beside the family of Baliga at times of trouble and is still fighting for justice to the family.